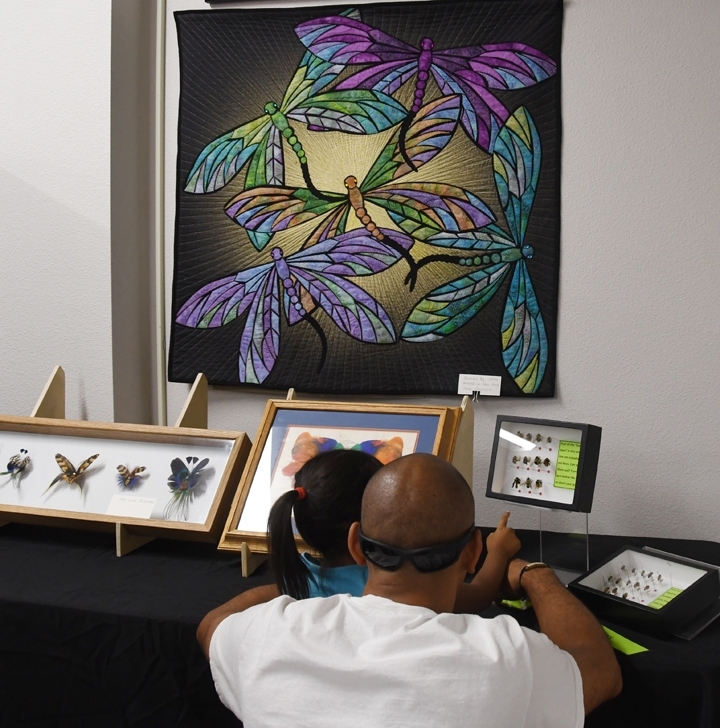 Five quilted dragonflies skimming the wall. 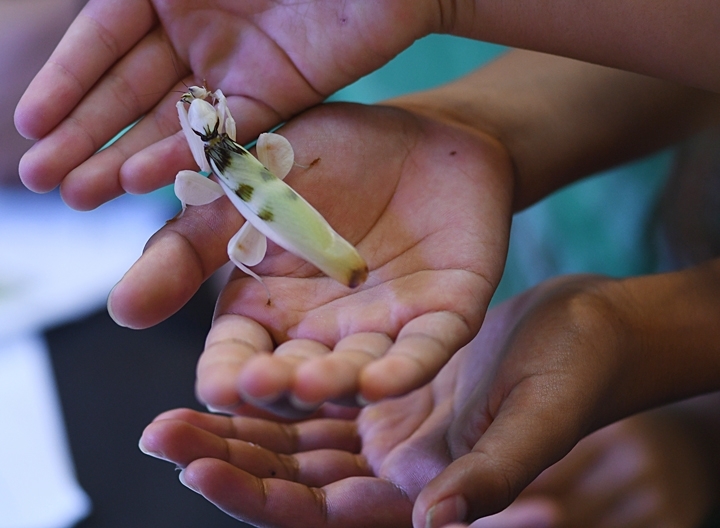 Eager hands cradling an orchid mantis. Eyes darting toward a hornet's nest. 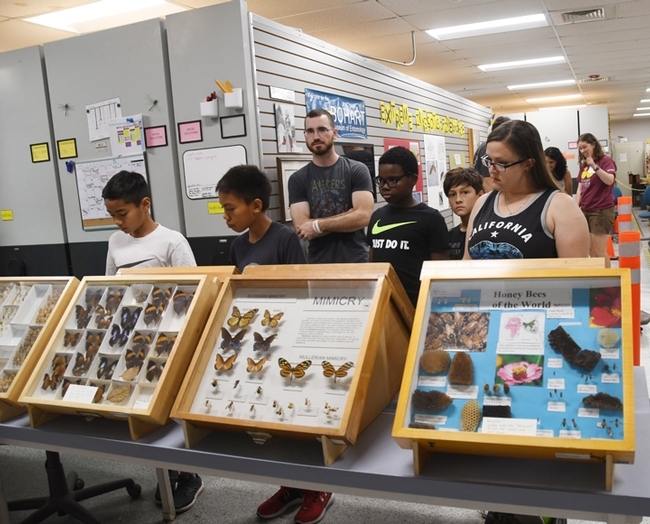 That set the scene at the UC Davis Bohart Museum of Entomology's three-hour open house, themed "Crafty Insects." 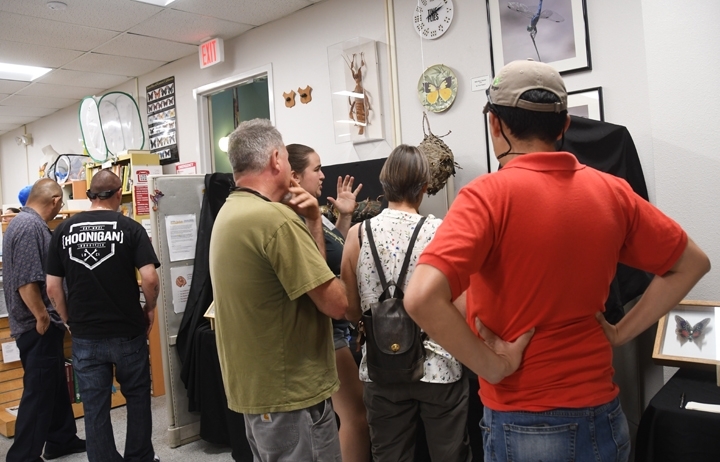 Visitors learned about the sneaky or cunning insects like praying mantids, and about the skillful insects such as hornets that construct intricate nests of wood pulp and saliva. Entomologist Jeff Smith, who curates the butterfly and moth section of the Bohart, loaned the quilted dragonfly hanging, the work of his mother-in-law, quiltmaker/seamstress Ann Babicky of Schofield, Wis. "She made it personally with us in mind," he said. 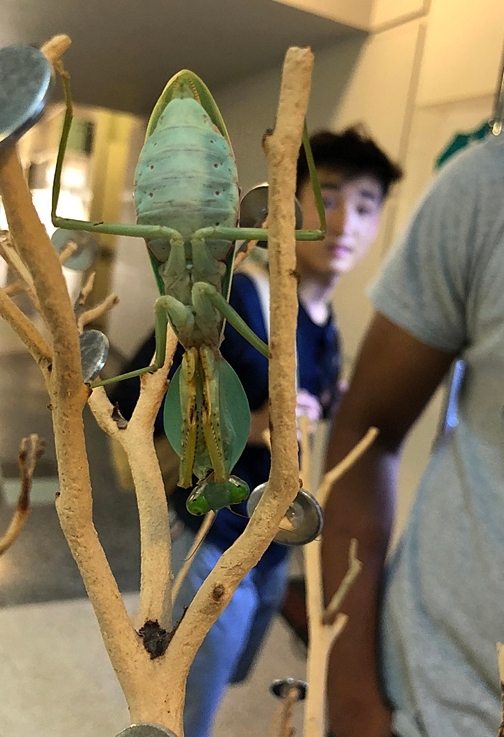 UC Davis entomology student and Bohart associate Lohit Garikipati, who rears mantids, loaned some of his favorites, including an orchid mantis, Hymenopus coronatus, a shield mantis, Rhombodera valida, and an Asian dead leaf mantis, Deroplatys truncata. 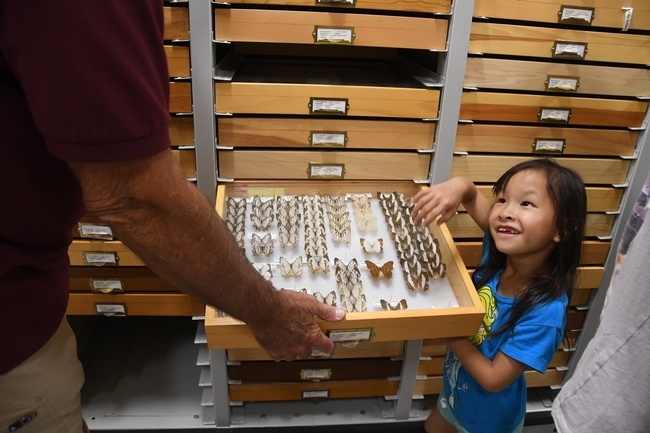 Garikipati, who serves as secretary of the UC Davis Entomology Club displayed mantids and walking sticks with club president Chloe Shott. Smith and Bohart associate Greg Kareofelas showed visitors the moth and butterfly collection, while UC Davis student Emma Cluff answered questions about a hornet's nest. Another UC Davis student, Isabelle Gilchrist, staffed the "paint-a-rock" table. (See Bug Squad blog). 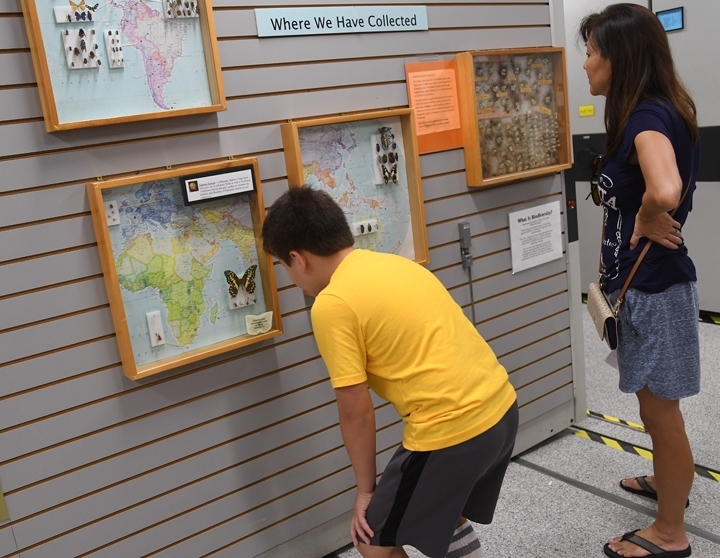 Tabatha Yang, the Bohart's education and outreach coordinator, coordinated the open house. 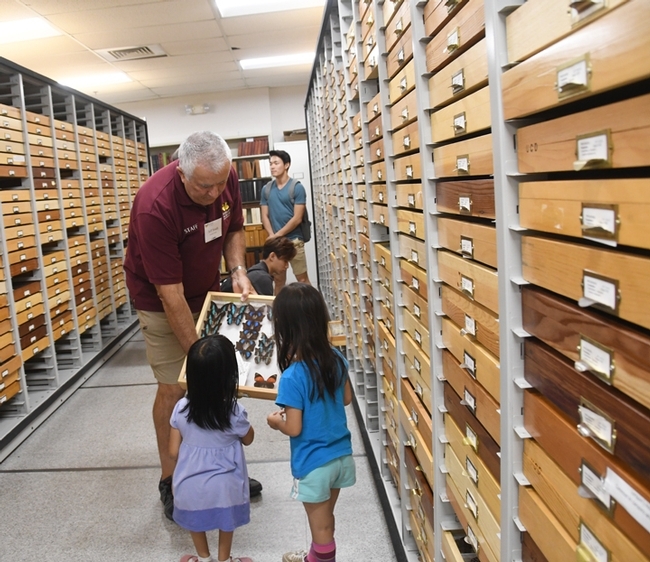 The Bohart Museum of Entomology, directed by Lynn Kimsey, UC Davis professor of entomology, is named for noted entomologist Richard M. Bohart. More information on the Bohart Museum is available on the website or by contacting (530) 752-0493 or emailing bmuseum@ucdavis.edu.